For years the world’s biggest asset managers have tried everything to slow Vanguard’s meteoric rise. Now a startling lawsuit, dismissed by some legal experts but credited by others, is accusing the low-cost investment company of building its empire on nothing less than systematic tax evasion. The suit, filed in New York by David Danon, a tax lawyer whom Vanguard fired last year, targets Vanguard’s singular, all-important mutual ownership structure. In this model, the fund management company is owned by the funds rather than a third party. Mr Danon alleges Vanguard exploits the structure to shift income and artificially reduce profit. He alleges this allowed it to dodge $1bn in US federal tax since it was founded 40 years ago. Mr Danon’s claims hinge on a core principle of US corporate tax law: that the pricing of transactions between related companies, known as “transfer pricing”, must be negotiated at “arm’s length”, not at below-market prices. Vanguard makes no secret of charging its funds “at-cost” prices for its fund management services, creating savings passed on to investors in the form of razor-thin fund fees. But at-cost pricing hardly constitutes a market rate in the fund business and leaves Vanguard improbably with “little or no profit” to report, the suit says. The company received a special Securities and Exchange Commission order when it was founded, approving the at-cost pricing model. However, the suit maintains that the SEC order concerns securities law compliance only, not tax law compliance, and no tax authority has ever examined the mutual ownership structure. Vanguard has emerged as an asset management juggernaut, with nearly $3tn in assets and consistently large inflows in the US over the past decade – won largely on the appeal of discount pricing. As the suit puts it: Vanguard’s illegal tax savings are the secret to its runaway success. “Vanguard’s costs are ... generally quite consistent with its competitors’ costs, with the notable exception of Vanguard’s tax costs,” the suit reads. 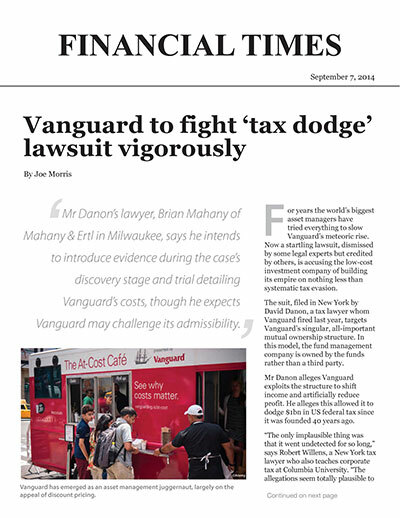 Mr Danon’s lawyer, Brian Mahany of Mahany & Ertl in Milwaukee, says he intends to introduce evidence during the case’s discovery stage and trial detailing Vanguard’s costs, though he expects Vanguard may challenge its admissibility. Indeed, lawyers representing Vanguard sent a letter to Mr Mahany last month accusing Mr Danon of violating state rules of professional conduct and Vanguard company policy by disclosing confidential company information in the suit and by taking company documents while still employed at Vanguard. “Vanguard intends to take all necessary and appropriate steps to protect its interests,” the letter states. The suit also accuses Vanguard of failing to file New York income tax returns, despite having extensive business operations in the state, and neglecting to pay taxes on a $1.5bn “contingency reserve” fund as well. Mr Mahany asked the New York attorney-general’s office to intervene in the case, but it declined. Officials from the office did not respond to a request for comment. Vanguard would not discuss the allegations, except to issue a statement calling the suit groundless and promising to fight it vigorously. Mr Danon has asked the SEC to shield him from any Vanguard retaliation under the commission’s whistleblower protections. As a whistleblower he would also stand to collect between 15 and 30 per cent of any recoveries under New York law, as well as a portion of taxes and penalties collected by the federal tax regulator, the Internal Revenue Service, under its whistleblower provisions. He points to Vanguard executive pay, which the company does not disclose publicly, as an opaque repository for income. “A mutual fund manager whose structure is permitted based on the claim that it aligns the manager’s interests with the interests of mutual fund shareholders should be required to disclose its executive compensation,” he says. Mr Danon’s line of argument “seems strained and problematic” to Lawrence Hill, a tax lawyer at Shearman & Sterling in Washington and a former trial attorney for the IRS’s office of chief counsel. “Finding fraud in an area as grey and nebulous as transfer pricing, and one that is subject to varying economic interpretations, is rare and extremely difficult to prove,” Mr Hill says. Mr Willens, however, calls the claims strikingly clear. “It’s a pretty classic case of a taxable entity dealing with its related non-taxable entity on other than an arm’s-length basis, with a view toward shifting income from the taxable entity to the non-taxable entity,” he says. No questions have been raised till now likely because the IRS typically pays little attention to mutual fund compliance, Mr Willens says. “I don’t think they see that as a particularly fertile source of revenue for them, and their resources are kind of limited,” he says. Vanguard’s funds rank among Europe’s least expensive, but there are nevertheless pricing gaps between them and comparable US funds. Daniel Wiener, editor of The Independent Adviser for Vanguard Investors newsletter, cites the example of the Ireland-domiciled Vanguard US Opportunities fund. Though it is managed in essentially the same style as Vanguard’s US-listed Primecap or Capital Opportunity funds, US Opportunities charges 0.95 per cent for retail shares, compared with 0.45 per cent for Primecap and 0.48 per cent for Capital Opportunity. Aside from Vanguard’s competitors, the only wronged party would be the IRS, not investors, according to Mr Willens.